Time changes most things, and physical constants are seem- ingly not immune from this contingency. The publishers' suggestion for a new edition has provided an opportunity for a thorough scrutiny of the contents of this book and for the adjustment to some fourteen years of changes since the last edition. At the same time the contents have been increased by the addition of one or two new tables, and current moves towards the adoption of an international system of units ex- plain the appearance in the book, wherever it is practicable, of S. 1. units. However, the habits of a lifetime are not easily changed, and it is too much to expect that despite careful proofreading the change of units has been carried through without errors. I shall be grateful for intimation of such mis- takes. I wish moreover to thank all those who in the past have taken the trouble to draw my attention to errors, or to superior determinations, or simply to offer advice or criticism. 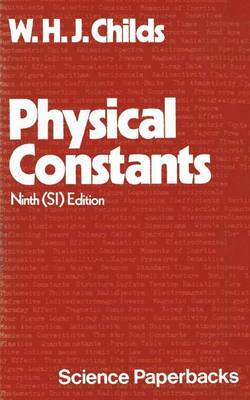 For those who do not find what they seek in this collection, more complete compilations of physical constants are to be found in: Tables of Physical and Chemical Constants, G. W. C. Kaye and T. H. Laby, 13th edition 1966, Longman. Handbook of Chemistry and Physics, 52nd edition 1971, Chemical Rubber Company. International Critical Tables. National Research Council, McGraw-Hill. Zahlenwerte und Funktionen aus Physik; Chemie; Astronomie; Geophysik and Technik. Landolt and Bornstein, Springer-verlag.